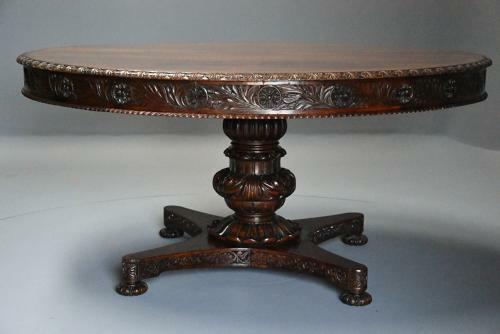 This table consists of a solid circular padouk top of fine, faded patina (colour) with carved leaf edge leading down to a carved frieze with circular roundels and scrolling foliage with a carved gadrooned design below - this carving is typical of Indian furniture of this period (mid 19th century) particularly from the Western region of India. This leads down to the bulbous turned and carved central column carved with scrolling acanthus and foliate decoration. The base is of quatreform design decorated with carved scrolling foliage with a carved apron below, all supported on turned and carved feet. A very similar example of this table can be seen in the Amin Jaffer book 'Furniture From British India & Ceylon' on page 342, Fig. 137 which shows a smaller table on an original photograph taken in the Reception Room in the Zanzibar Agency 1865-1869 - this was probably the American Consul's residence in Zanzibar, it appears that Anglo Indian furniture was readily available in Zanzibar and Kenya at this time as Indian carvers were working on the East coast of Africa as well as in their homeland. Please note: the table top has been shown in the tilted position - this is for photographic purposes only as due to the depth of the frieze although the top does have a tilting mechanism it was not originally made to be secured in the tilted position.